Railpictures.ca - Ryan Gaynor Photo: This (former) CSX GE C40-8W and the steel mills in the background set a scene that looks more like Illinois than Ontario. Nonetheless, GECX 7700 is seen guiding CN train no. 330 across Sherman Avenue on a pleasant June evening in Hamilton, Ontario. | Railpictures.ca – Canadian Railway Photography – photographie ferroviaire Canadienne. 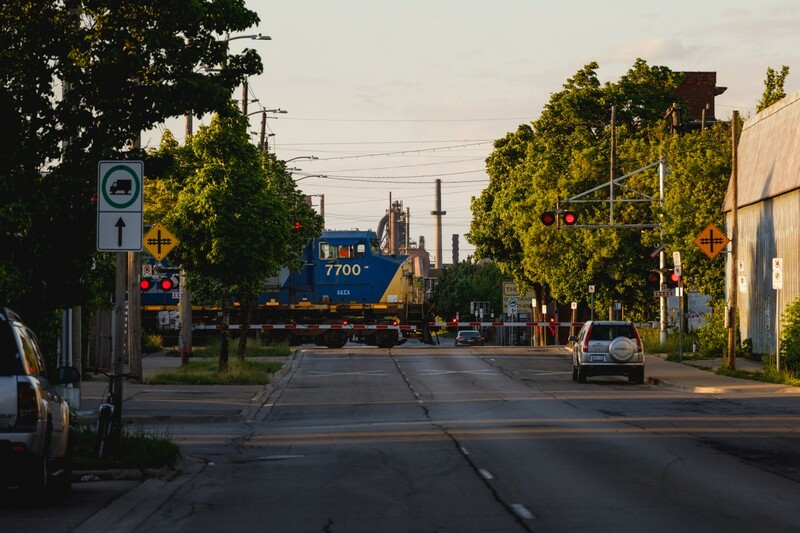 Caption: This (former) CSX GE C40-8W and the steel mills in the background set a scene that looks more like Illinois than Ontario. Nonetheless, GECX 7700 is seen guiding CN train no. 330 across Sherman Avenue on a pleasant June evening in Hamilton, Ontario. Get out of my hood! Bang bang! Does Steel Steve know you’re in his ‘hood? You sure were stuck for a sun angle with this shot. Really nice effort!! !